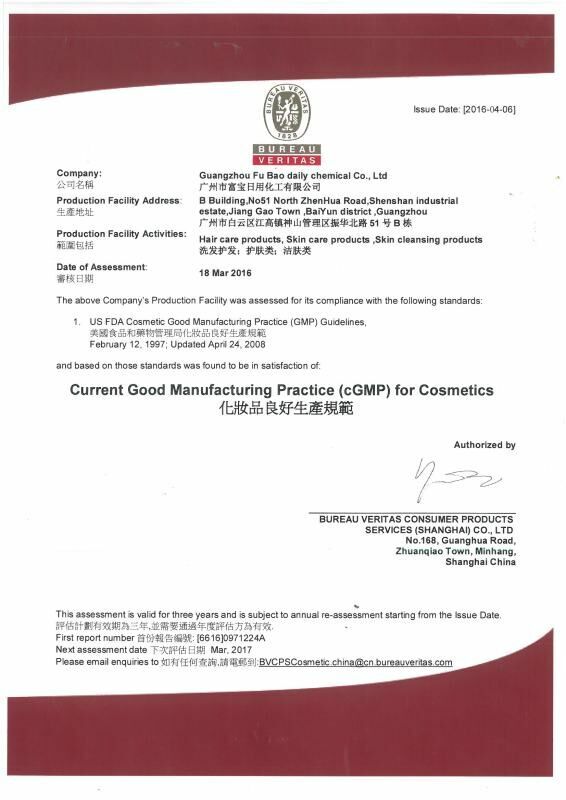 Company Overview - Guangzhou Nine Red Fine Chemical Engineering Co., Ltd.
8YRSGuangzhou Nine Red Fine Chemical Engineering Co., Ltd.
Our Company is the OEM factory of skin care products and beauty products in China. We focus on whitening cream, breast cream, slimming cream and ance treatment cream. Our mainly products includes: 1) Face whitening cream and whitening body lotion2) Breast enlarge cream and body slimming cream3) Ance treatment cream. Anti-acne cream.4) Facial mask, facial cleanser, toner, lotion, essence etc5) Bleach cream and BB sunblock creamOur company is located in god mountain industrial district of Guangzhou, with beautiful scenery and convenient transportation. We have strong new product development and production capabilities, and always grasp internationally latest technology. We have a modern workshop, with the high-tech development content, to produce high-pointed, highly specialized and effect-remarkable products, such as acne removing products, hair removal products, slimming products, breast enhancement products, skin care frost, skin care emulsion and facial masks in professional skin care field. In cosmetics and processing (OEM) industry, our company has certain popularity and reputations. We are the enterprise as the first choice of customers. We have a large and professional personal care cosmetics processing factory. We ensure processing efficiency and product quality. At present, 20% of our products are exported to customers abroad. Our main sales markets are Europe, the Middle East (Dubai and Saudi Arabia), Southeast Asia, Central and South America, Africa, and other countries and regions. We are a import and export company with cost effective products.Our company does not satisfy with the current achievement, and just keeps trying to develop new materials and new products. Also we have constantly improved the quality of products.Company Tenet: 1) Quality: the product quality is a company's most basic survival conditions, and also best reflects the strength of our company. Our company has been adhering to the concept of "high quality development and production" for a long term. 2) Good Faith: our company's good faith is a company's most basic moral quality, and one of the company's images and reputations. Our company has been insisting on the principle of "honesty is the operation and development of the standard" for a long term. 3) Service: Let the public accept the basic principle - "quality - honesty". Service will be a key factor of a company's success or failure. Our company has been dedicated to "service is the first" attitude for exchange and cooperation for a long term.